Golden Star was within walking distance. It was cold. 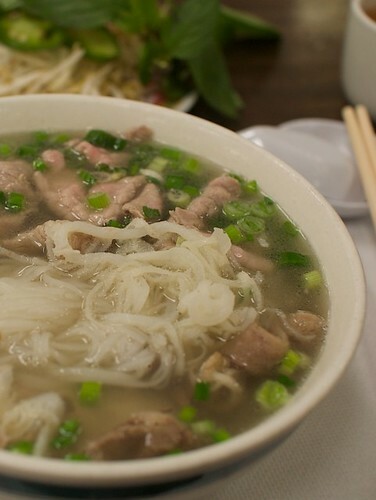 What better way to end off a busy work day than to have a big, hot bowl of pho, right? That’s exactly what I was thinking when I plopped down at Golden Star on the edge of San Francisco’s Chinatown. I had to run to the ATM beforehand because they were cash only, but with a $20 in my hand, I was golden. For about $5 for a pho dac biet, it wasn’t too bad. The soup had some cloudy bits floating in it, but it did taste pretty good. My tripe and tendon was also surprisingly flavorful. A successful dinner by my book. I’m still exploring the area around the SF office for food and I could have done a lot worse on my search for pho than this, so I’m glad I found it so early in the game. It’s definitely a place I’m going to keep in mind when I get the craving.